This bread is so good! 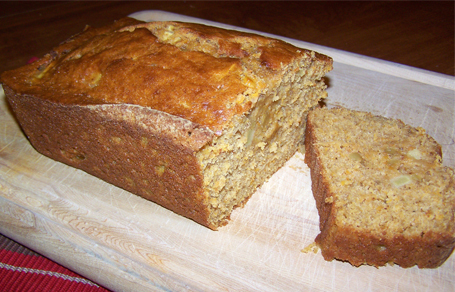 It has a nice blend of spices along with chunks of apple and ginger that makes this bread something special. It smells so good cooking and fills the house with a wonderful aroma. My family loved it! Preheat oven to 350 degrees F. Grease and flour 2 loaf pans(9x5x3 inch), set aside. Stir together dry ingredients, flour, soda, baking powder, cinnamon, nutmeg, and ground ginger with a wire whisk until well mixed; set aside. In a mixer bowl, beat eggs, sweet potato, buttermilk, applesauce and canola oil until blended. Blend in flour mixture until just mixed. (do not over beat). Fold in apples and candied ginger. Divide batter evenly between loaf pans and bake for 45-50 minutes, or until toothpick inserted in center comes out clean. Let cool in pan for 5 minutes before removing to wire rack to cool completely.